Wood Burning Stoves Huddersfield Wide – What Are Your Options? Wood burning stoves Huddersfield: have you been searching the internet for wood burning stoves available to purchase in the Huddersfield area? Huddersfield town itself is connected to the national motorway network via the M1 and M62 motorways. The M1 passes about 10 miles (16 km) to the east. The M62 passes about 2.5 miles (4.0 km) to the north and Huddersfield is served by three junctions: Mount (A640, J23 – limited access), Ainley Top (A629, J24) and between Brighouse and Cooper Bridge (A644, J25). Because of the impressive accessibility of the town of Huddersfield, residents have easy access to a huge range of Yorkshire stoves in our extensive showroom. We at the Leeds Stove Centre aim to offer the widest choice of wood burning stoves possible in the Huddersfield area. With a large range of traditional styled wood burning stoves and modern wood burning stoves, you’re certain to find the perfect stove for your Huddersfield home. Whether you live in a traditional cottage or a modern studio apartment, we have the perfect stove for you! By choosing to install woodburning stoves Huddersfield area, not only are you being eco-friendly and heating your home for much less, but you are also creating a focal point in any household. We have recently upgraded our showroom located in Leeds and now we have a number of working displays of our Wood Burning Stoves. For homeowners who have access to a plentiful supply of wood, wood burning stoves Huddersfield wide are a cost effective, attractive and ideal addition to any type or style of home. The Biggest Range Of Wood Stoves Huddersfield Has To Offer! 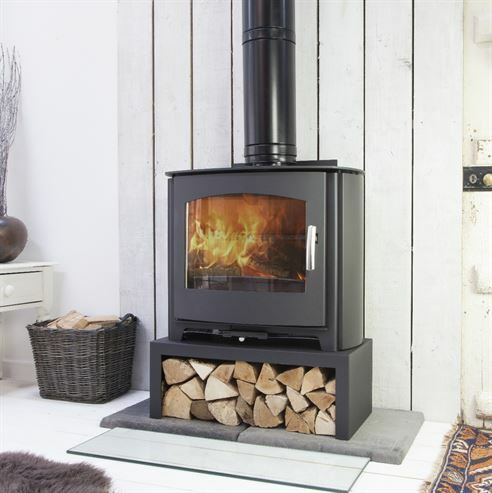 At the Leeds Stove Centre, we promise to supply you with the highest quality wood stoves Huddersfield has to offer. Therefore, we only supply tried and tested manufacturers who have delivered top quality, well-built stoves. With a large choice of brands to choose from including Yeoman, Hunter, Dunsley, Charnwood, Stovax, Dik Guerts and more, you’re spoilt for choice for styles and accessories. Each brand has unique styling and offers its own ‘wow’ factor. Browse through our website or call into the showroom and you’re certain to find your ideal stove. Whether you’re after a traditional-looking version to warm a cosy sitting room or a cool contemporary design to sit at the heart of an open-plan living space, you’re sure to find something to suit. Furthermore, we also offer expert wood burning stove installation Huddersfield wide, along with fitting fireplace and flue systems as required. We have a number of highly trained, professional HETAS registered installers with years of experience. Our installers can fit your stove complying with current building regulations and to a high standard. If you need any more persuading that wood burning stoves Huddersfield way are a good option for your home, they’re even low-maintenance. A dedicated wood burner will be specifically designed without a fixed grate, but with a flat base. When you burn logs, it is more effective that new logs are placed on a bed of ash to provide maximum efficiency and heat output from your wood burning stove or fire. So, you do not even have to clean it very often! If you would like to view your options from the wide range of stoves available at Leeds Stove Centre or book a free installation survey, please don’t hesitate to browse our website at https://www.leedsstovecentre.co.uk/ and contact us on 0113 255 5622 if you have any queries.